The Los Angeles Memorial Coliseum has accrued a plethora of historic tales. Being eight years (or 5 coaches, if you prefer that unit of measure) short of hitting its centennial anniversary, you would probably expect as much. In the end, that very historic value could very well be a ridiculously oversized speed bump in the renovation plan. But that may only be part of the problem. If you haven’t been to the new website, go take a look at it now. Fancy renderings and flowery language obscure some glaring issues with the proposal. What they also fail to mention is that the estimated $270 million project will reduce the seating down to 77,500—a reduction of 16,107 seats. They’ll never notice the difference! *Red denotes adjustment for post renovation. Every single blue blood program boasts a seating capacity of more than 80,000: Michigan, Ohio State, Alabama, Texas, Oklahoma, and Notre Dame. Even fringe ones like Tennessee, Penn State, and Nebraska. At least be bigger than South Carolina! We already have to put up with their, “We’re the real USC” crap now. Imagine if their stadium was bigger than ours too! If that’s an impossible task, can we at least get 80,000? Is this sending a message to the world? Has the university or athletic department decided, like Stanford, to simply drop football’s priority level a few notches? Stanford dropped the number of seats in their stadium by over 30,000 during their renovation about a decade ago. It would be sad to see a USC’s football program, so rich with tradition and history, relegated to such a position. The home attendance numbers have certainly dipped after Pete Carroll left for the NFL (refer to chart below), but how by how much? A quick glance at these numbers might have you thinking that the 77,500 might not be too bad of a number. Ever since Pete Carroll left, average attendance has been under that amount. Hell, a little more than half the games would not be a sellout even with the smaller stadium size. That type of thinking is flawed though. Averages don’t really work well in this situation. About half of the games are above the 77,500 limit, including six sellouts. That means there would’ve been boatloads of money left on the table for those games. I hate math, so we’ll do an extremely conservative estimate. We’ll set the price of tickets to be $75 each (face value for a nosebleed seat in a rivalry game). So if a rivalry game swould’ve sold out, that’s $75 x 16,107 seats for a total of $1,208,025. That’s $1.2 million in revenue you would’ve missed out on for a single sellout rivalry game. Keep in mind that a significant number of the seats they’re taking out aren’t nosebleeds, they’re the donor seats that were under the press box. Will the new personal seat licenses and luxury suites make up for that? Also note that this would mean packing out some terrible seats in section 27-29, 33, and 1. They are behind the band seating and pretty far from the field. Tack on that these are some of the most tumultous times in USC Football history. The first two midseason head coach terminations in USC’s 127 year history just happened within the past two years. Unprecedented and unjust sanctions were handed down about five years ago. With more stability, and a winning team, the attendance would easily average above 77,500 again. As long as we don’t get a repeat of the 1990s, all should be well before long. Take a gander all the way back up at the stadium size chart. USC’s company in the US Football Stadiums side? The Washington Redskins and the Jacksonville Jaguars. 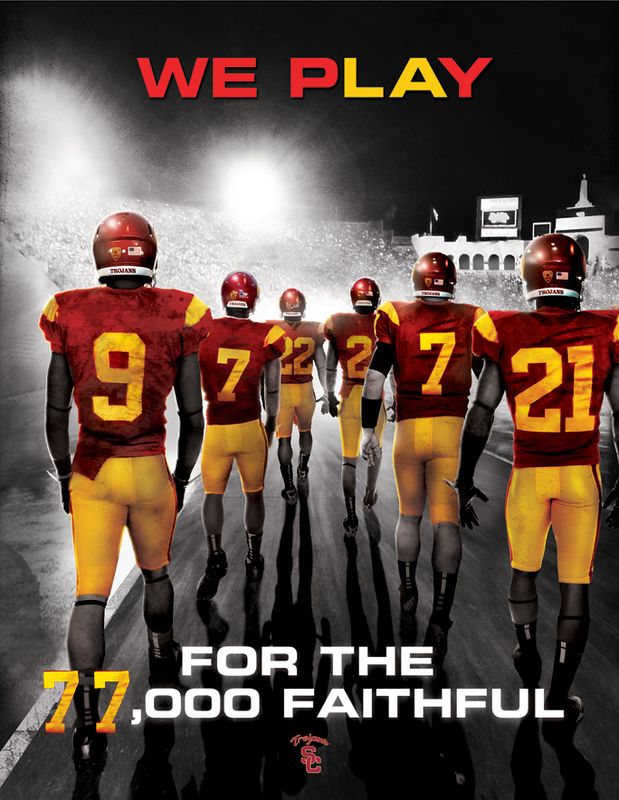 It appears USC is positioning the Coliseum to be a venue for an NFL that comes to Los Angeles. That’s great and all, but are we really mortgaging the future for a team that is going to be here for 3-5 years at most? They’ll bring in some money, but they’re gone as soon as they get their new stadium. All in all, these plans seem a tad short-sighted from my perspective. Since the Coliseum has been placed on the National Register of Historic Places, only so many alterations can be made to the structure. Perhaps that has something to do with these limited plans? I know they have to make ADA compliant stairs, with railings and such. And some of the aisles definitely need widening. Furthermore, the Coliseum Commission left the place in a mess and its tough to bring together the money to get such a large project done. I understand all that, but I was still expecting something less…underwhelming. At best, we can hope that this is just a short term plan to get some money from NFL tenancy, which they can use to do some more drastic overhauls down the line. Maybe it will draw the 2024 Olympics, incentivizing the government to sink some money into it. All I’m saying is maybe there is something I’m not seeing here. If you got inside information that makes me look like an idiot for speculating, please contact me. I’m a reasonable person (most of the time). I will gladly rescind this post and replace it with a giant “I’m wrong.” Otherwise, I don’t want the Coliseum shrunk down to 1930s size.